In The Guardian last weekend, Ian Jack wrote of a trip he made for The Sunday Times to Glasgow in 1980, with a brief to “concentrate on its fine architectural legacy and the lifestyle of its middle class”. He went with the Magnum photographer Raymond Depardon, who was much more taken with the Glasgow Jack was trying to avoid: “the drunk, the waif, the grim line of tenements awaiting demolition”. Jack eventually gave in and took him to the Saracen’s Head, where “men with those thin white lines on their cheeks – evidence of a razor slashing – sat drinking and looking ominous”. The story reminded me of a passage from Laidlaw, the first of a trilogy of detective novels from William McIlvanney, a writer who can build the streets of Glasgow in a few paragraphs (see my earlier post). McIlvanney calls his pub The Gay Laddie. Heading for Glasgow for the Commonwealth Games? Then have a look at the city as it was until recently through the eyes of Detective Inspector Jack Laidlaw. William McIlvanney’s trilogy of Laidlaw novels, Laidlaw (1977), The Papers of Tony Veitch (1983) and Strange Loyalties (1991), had shamefully been out of print until the start of this year, when that enterprising publisher Canongate, which had snapped up his back catalogue, republished them with several of his other titles. “Sunday in the park — it was a nice day. A Glasgow sun was out, dully luminous, an eye with cataract. Some people were in the park pretending it was warm, exercising that necessary Scottish thrift with weather which hoards every good day in the hope of some year amassing a summer. Laurie Lee believed in writing at a distance from his subject. He wrote Cider with Rosie, his memoir of his childhood in the Gloucestershire village of Slad, in a back attic in London; he recalled his wanderings in Spain in a top-floor room in Stroud. In his last recorded radio interview, made available by BBC Radio Gloucestershire again to mark the centenary of his birth, he explains why. He also talks of the “naive innocent idiocies” that took him into Spain on the eve of the Civil War. Adrian Bridge’s account of his journey in the footsteps of Franz Ferdinand (see previous post) is now online. I’ve just added a review of The Telling Room by Michael Paterniti (Canongate) – flit lit with a difference. The recognition last week of the Cornish people as an official minority was just a late acknowledgment of a truth, according to Philip Marsden. Their homeland, he writes in The Guardian, is certainly not England. I’m publishing an extract this week from another book that was on the short list last year for the Royal Society of Literature’s Ondaatje Prize, awarded for a work “evoking the spirit of a place”. 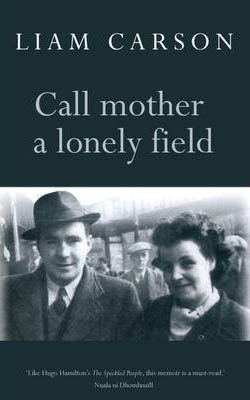 It’s from Call mother a lonely field by Liam Carson, a memoir of growing up in an Irish-speaking family in Belfast at the time of the Troubles. The title, incidentally, is borrowed from a song by Jackie Leven, who was lead singer in the 1970s of the band Doll By Doll before going on to a solo career in which he collaborated with, among others, the crime writer Ian Rankin.